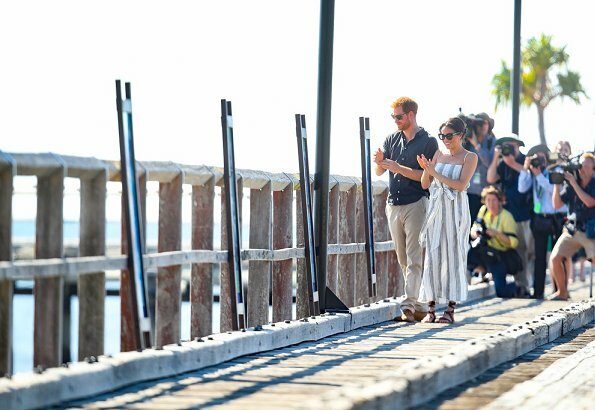 On the 7th day of their Australia tour, on October 22, 2018, The Duke and Duchess of Sussex visited Queensland’s Fraser Island. The Duke and Duchess were welcomed by the Traditional Owners of K'gari, the Butchulla People and the Premier of Queensland. 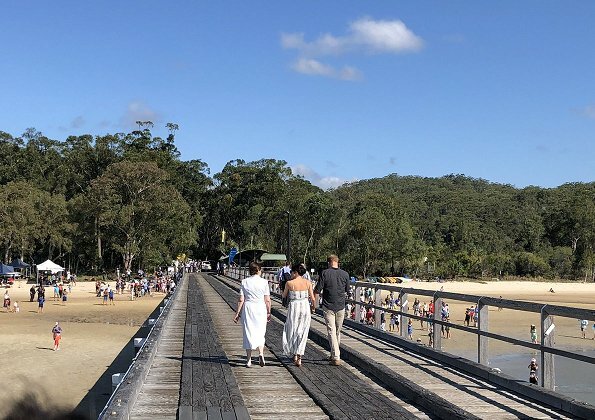 The Duchess and Duke of Sussex attended a met with people session at Kingfisher Bay Resort, and the visit ended with a walk along the Kingfisher Bay Jetty. (Princess Marie wore Pineapple dress by Reformation). No, no, no... this is not royal at all, the opening of the skirt looks cheap and ridiculous for a royal. I just can’t believe she’s representing the queen dressed like that. Totally agree. 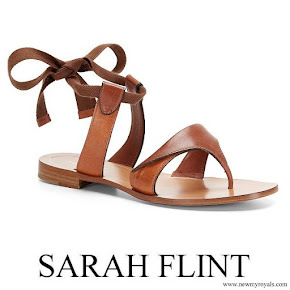 Don't like her shoes. Agree. The side slit is way too revealing. I have no problem with her more casual style but this is going too far. Do not agree, she looks like an Australien and the dress looks fresh and summery. Oh, for Heaven's sake. Meghan looks absolutely adorable! She's California-raised and knows to respect the heat and the easy-going environment when you go to beach communities--especially when representing the Queen. It's hot in Australia--they are heading into high summer. Look at photos 10, 11 and 12. She's radiantly gorgeous and the fresh light stripes show off her complexion and hair. Wearing a formal suit or a dressy dress would be ridiculous in this environment and would make residents feel as if their normal wear was not up to par. the fabric of the dress reminds me on an old teatowel. in prison. The shape is also not nice. Also for a private beachday I wouldn't choose it. Especially for representing the queen it is very, very bad. Of course you can stay casual when visiting a beach community, but that is really, really the false way of casual. Nobody is saying she is not gorgeous. She is a stunningly beautiful woman. You can wear a summery sundress and look smart--quite simply Meghan doesn't look smart at all. The dress is like a sack tied in the middle and does nothing for her.While one assumes, she has some input into the choice of clothes, these comments are criticisms primarily of the dress and NOT the person. 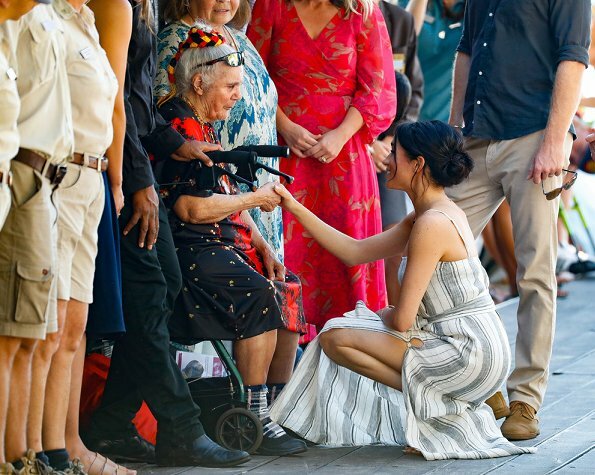 hm nice dress but it would be more confortable for Meghan to ba able to walk without having to bother about the long side slot, bearing in mind she is not just a tourist. Fine for a private beach day, but not for a public appearance, very disappointing. This was exactly my thought. What did she think? What did her stylist think? @Anne-Minni, I know her friend Jessica Mulroney is on the Royals tour and helps Meghan with clothing, but did both women not see, that this beach dress does not work? Unfortunately Meghan does not seem to understand that Royalty and celebrity are different. 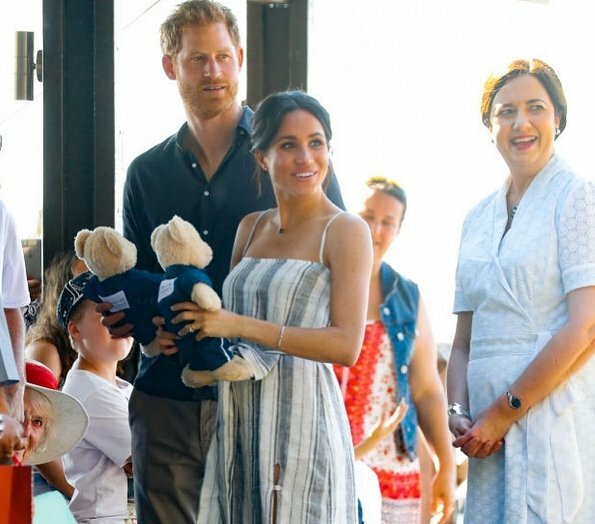 Unkempt hair, see-through dress, thigh high slit..... she's dressed like a starlet on holiday, not as a representative of Her Majesty and the British People. One dresses up when making a visit as a sign of respect for the people you are visiting. Even casual clothes should be neat and appropriate. She looks like she rolled out of bed ten minutes ago! A bit of a slap in the face for the people who no doubt got everything tidy'd up to meet HER.....? First failure in clothes during this tour. First total failure, perhaps. However, there have been very few outstanding successes. The outfits are so forgettable that I've had to search back through the posts to find them!---best so far the white dress, the Roksanda with the blue hem, the Jason Wu black dress for the dinner. The others have blended into a sea of navy and black. The style of the top of the dress makes her look very boxy. A comfortable dress no doubt but simply wrong for her figure. I like the dress, except for the side slits ! Yes, we want her to feel comfortable, but not at the price of dignity when representing HM. This is a big no no ! Every day her taste gets worse. I find it hard to believe that there's no one in their 'entourage' to steer her the right way in dressing and fashion in general. 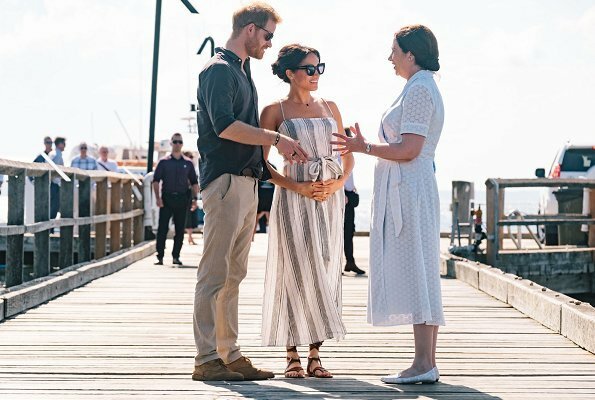 Yes, it must be hot there; but this casual beach dress with the big slit proves once again that this "royal tour" coinciding with the Invictus Games is simply a huge holiday for Harry & Meghan. A Royal tour is by no means a 'holiday'. 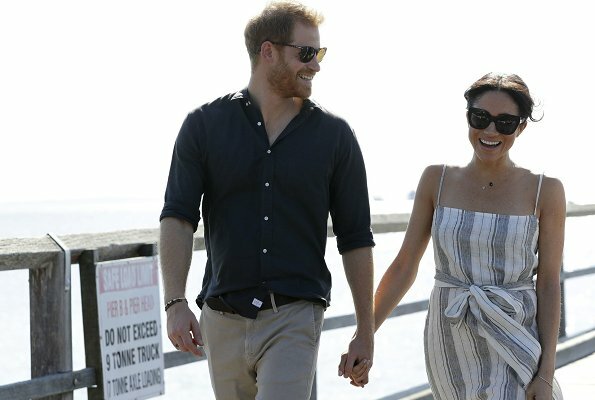 Harry and Meghan go through 75 appointments in 16 days. 4-5 representative dates per day is hard work. Some people may not know it. They decided to make it look easy and underline it with casual clothing, but it is still work. This day's outfit Megahn chose is too casual though. Cannot understand how anybody can keep such a long and full of appointments tour as holiday. Try to do 16 days without any day off after long fly, to be like in magnifier from morning to night. I bet you would keep it as a real work. I've done trips to other countries and been on the go from the day I get there to the day I leave (sometimes 18 days later), without an entourage catering to my needs. Yes its tiring, but it's by no means a difficult as an actual job. I'd love to keep that as my real work, yes. The least she could do is dress appropriately. Anonymous to travel and have your own activities long days is very very different to do work with cameras monitoring you whole time and having official program. It is really such a funny thing how other people´s work is always so easy, basically no work at all. Especially if it is woman´s work been done. Also if and when Meghan and Harry have managed to look like they enjoy the tour, it seems to be less desirable than if they would look miserable. Never said my trips were for tourism. I am also a woman who's job is often underappreciated. And I work for a conservative law firm where I need to dress a certain way, where skirts and dresses cant be higher than 4 inches from one's knees. That's my frame of reference that I use to base my criticism of her wardrobe on. I really hoped Meghan would push boundaries for this family, including moving the dress code to the less rigid side. This dress in particular looks messy and something to wear in your backyard BBQ or at the beach on top of a swimsuit. With or without the slit. The slit makes it even more of a casual dress and makes the event look like a private event invaded by crowds and cameras (at least in still photos. Part of her job is to "be the face" of the monarchy. Diana learned how to use her fashion to work the press and Kate is starting to do so as well, but I'm disappointed Meghan, who was a C-list celebrity before this, hasn't managed to figure it out before this. Would I love to have cameras scrutinize every move I make? No. I dont think Meghan loves it either but this is a small portion of her life. 16 days, planned ahead of time, with plenty of time to prepare, and no worry that if you mess up you'll be fired. You play a role in front of the cameras just like many of us play a role in our jobs. She could let herself be seen on a private day trip in this dress and I'd be happy she's pushing the limit. But this is her job. This is the only part of her job (oficial events) many people will see her in. Many people wont even know what her voice sounds like because they won't care what she thinks or says. She needs to learn how to use the tools she has available to get her messages across. Again, yes I would love to have trips like this be my job. Yes it would be hard work. Yes it would be tiring, but let's not fool ourselves into thinking its unbearable. For some people, it would be. For a woman in her mid 30's who was a minor celebrity and worked at making her media profile bigger, I wouldn't expect it to be unbearable. I might be wrong, but I doubt it. Sur la 7e photos ils ont offert 2 nounourses ça pose question? 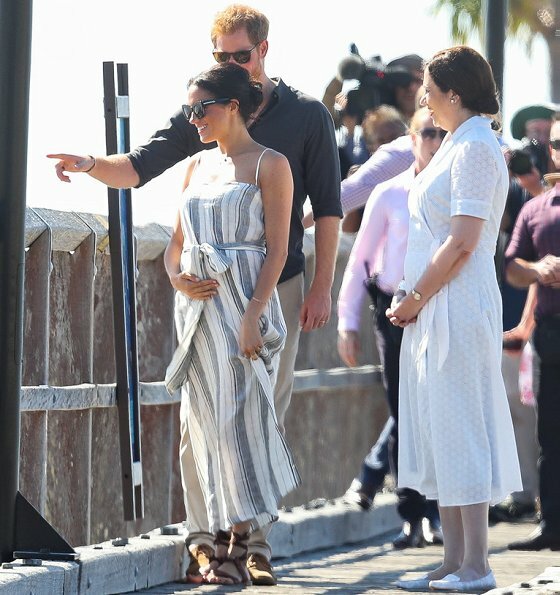 I think the dress looks great and as an Australian I think Meghan’s dress is quite appropriate for a casual meet and greet. I'm Australian too and as far as that goes I beg to differ. She is not a tourist strolling along the jetty. She is representing her majesty the Queen and this is not IMO a suitable dres. She is supposed to be working here. Nice dress for the Backyard, but not for this event. Also the slit is way too high, don't care for the sandals either. Well sometimes she is not getting it wrong,she'll get the hang of it. But her smile and interaction with the people is good. Today they are having a lovely holiday; me like! Cette robe fait jaser et parler. Mais elle est sur le site de Kensington et de la famille royale. Sa robe à été validée.....elle ne l'a sortie de son placard .....c'est un peu osée mais je ne suis pas choquée au moins le designer aura une renommée d'autant plus que la robe est écologique. Vous oubliez une chose ses goûts ne sont pas les vôtres. Au moins elle est audacieuse comme l'était la Duchesse de Cambridge au début de son mariage. Wait and see . I wish Kate would be more daring again. Très belle robe, magnifique Meghan!!! I don't understand why she changed dresses. I liked the burgundy one better, and it was still appropriate for this type of beach outing. Don't care for this dress at all. Some may say English royals are too stuffy in their fashion. But at least it has been tasteful with dignity and class. This dress is not in keeping with that standard. Her husband's mother would have never worn this for a public appearance. Sadly, this was not a good choice. I think it would have been somewhat more appropriate without the high slit. Meghan looks wonderful. As an Australian, it's been a pleasure to see Meghan dress so appropriately for each event that they have attended. She should change her stylist!! In general this dress looks nice and Meghan is a beautiful woman who can wear dresses with spagetti straps. But the slit is much too long for an official appointment. A good stylist should know this and become familiar with the role of her client. Meghan and Harry represent the British Crown , they aren‘t tourists.I avoid comparing Catherine and Meghan but Catherines (or the stylists) choice of her clothes is very clever. At the beginning you need competent help to master the new tasks but she doesn‘t get it from her stylist. I was looking at another site, and when the complaints came rolling in about the slit in the dress, someone was ready with a stream of pictures of Kate wearing dresses with deep slits or simply being unbuttoned so a great deal of leg showed. The person posting also brought up the fact that Princess Anne and Princess Margaret both wore mini skirts back in the day, which didn't seem to bother the Queen because she didn't put a stop to it. I understand that there will always be traditionalists, but time marches on. It really wasn't so long ago that Diana was shaking things up with some of her fashion choices. We have seen changes in so many other areas other than fashion, too. Not only did Diana deliver her children in a hospital, Diana changed the way royals parented their children, becoming more hands-on. These things were big news at the time. "Arranged" marriages to other blue bloods are now a thing of the past. Even the Queen, as traditional as she is, still has made her mark by remaining true to herself. Let's remember what we are seeing is nothing new. Meghan, and to a lesser extent Kate, are a new generation of royals setting new standards. Beatrice and Eugenie have been true to themselves for years and have been ridiculed for it. Zara had a tongue piercing. All new things take time to adjust to. It‘s Not the slit only, look at the fifth picture: this dress is not suitable for an official appointment, it doesn‘t fit and the fabric is too thin . 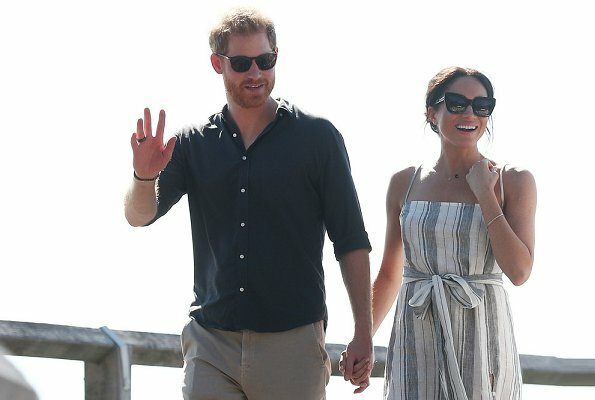 The dress Meghan wore on Bondi Beach has been much better. Of course, Catherine wears high leg slits , but she still looks properly dressed. And as far as traditions are concerned, some things should be retained, because not everything is progress. The fact is, if you want to be taken seriously in business, you have to dress the part. As a representative of the Queen both Meghan and Harry are not dressed appropriately. People have gone to a lot of trouble to meet them and organise events. The least they could do is put some effort in. I'm very fond of both of them. Cannot believe how rude comments some of the writers write here about Meghan. One failure among all these clothes she has had in this tour and several comments go straight to person. Just a little mercy, please. She is still totally new to this royal circus. Ok, but she‘s not in her twenties anymore and she is a media professional. Most of the comments aren‘t rude, they don‘t criticsize the person, but the clothes. By the way, I remember the criticism that Catherine had to take in the beginning. Don‘t use too yardsticks. Both , Catherine and Meghan are representatives of the British Crown and this is an privileged position and they are obligated to fill it. Monty; I do recognise similarity with Catherine´s feedback here now, don´t know witch coutries the writers here represent, but it seems really very hard to be a newcomer to British royal house. Nothing they do can ever be right. Unbelievable - so much ugliness and nastiness! At first- look how is Harry dressed- and then think about your ugly comments. She was perfect dressed as every day and always.